Calgary Rants: Another Inconvenient Truth! This was a great email that I received....pretty much speaks for itself! 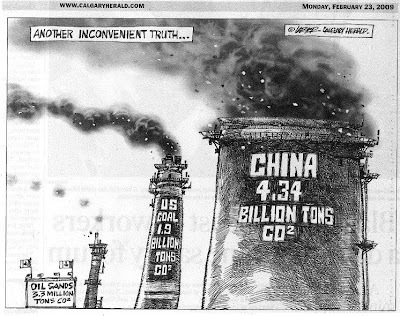 Canadian oil sands CO2 emissions are 0.17% of the US coal industry and 0.08% of China's total CO2 emissions. Canada's supposed dirty oil is an insignificant drop in the bucket compared to the American's very dirty coal and to China's very dirty air. Canadians must recognize that our national pastime has too long been to sever our noses to spite our faces. Oil and gas made up 21% of Canada's exports in 2006 and is at the top of the list of all Canadian exports. Think of it this way, every Canadian across the country (from St. John's to Victoria) must recognize that 21% of each dollar you have in your account or wallet has gotten there because of oil and gas exports from B.C., Alberta, Saskatchewan, Manitoba, Nova Scotia and Newfoundland. This is bad logic, and it kinda drives me nuts when people use it. Obviously China and other big emitters need to come onside. However, how can Canada/Alberta be a leader in promoting positive steps to combat climate change if we don't address our own problems. Hell, if our problem is so small, it shouldn't be any trouble to address, no? When the US spews the same amount of GHG in a single day that Alberta's oil sands emit in a year (! ), then why should Albertans be on the hook for doing anything. Sorry, the ball's clearly in someone else's court, but not Alberta's.